FYI, the WOWOW version is now out, if you know where to find it. Ma chérie is amazing. The concert is really good, but she really needs to release new music. I'm tiiiiiiiired of the same songs being played at every single tour. I really enjoyed this show. I didn't know that she says SHAZAM! in that one song -- which changes the entire way I listen to it. I actually appreciated the visuals and dancers this time round. The setlist looked pretty disappointing, but she did a pretty good job of making them work. She definitely NEEDS to release a new album before she tours again. Haven't watched it yet but I figure I'll get around to it. As someone who's usually a fan of her smaller shows I'm not super pressed on it, especially since the songs I haven't already heard live are the more blase ones she's released lately (e.g. Jiyuu-dom, Manukidoori, etc.). I'm tempted to wait for the DVD release to see if Hai Hai makes it onto the encore selection. It won't. The day they recorded this, she played different songs for the encore, sadly. 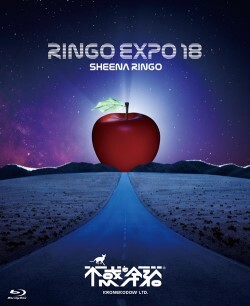 Kronekodow has announced the Blu-Ray and DVD release for Ringo Haku '18 on May 1st. More info here. Exciting news (for me at least) - Hai Hai has made it onto the DVD bonus tracks! It turns out the DVD includes both her Nov. 25th and 22nd dates. Apparently, there are also murmurs of a new album release also in May, but who knows. Last edited by thespidereggs : 2019.03.20 at 06:41 AM. Looking forward to Hai Hai. If she's releasing an album in two months she'll have to make an announcement sooner than later. I can't imagine what the tracklist will look like with all the singles she's released since SUNNY.